The 37-year-old CEO is just doing her job—and making us question how we do ours. 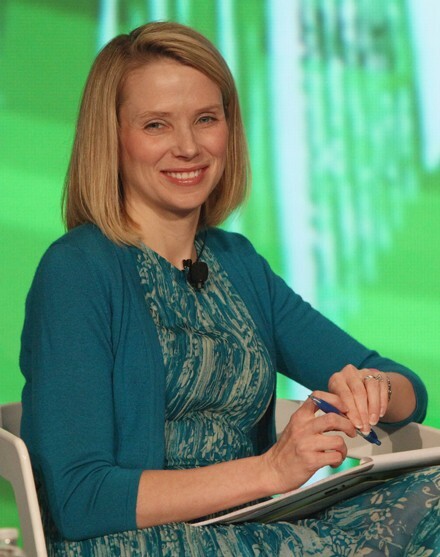 Yahoo CEO, Silicon Valley goddess, and new mom Marissa Mayer is inspiring and maddening. Or maybe it's just that everyone wants her to be inspiring and maddening, and she's just doing her job. 1. Would Twitter even notice if I tweeted about my (future but maybe never) pregnancy? 2. How much more can I reasonably grow my Twitter followers while still in my childbearing years? 3. Is the mix of serif and sans serif fonts in the headline a subtle nod to Mayer's research of serif v. sans serif fonts for Google search results? 4. Are serif fonts really more readable and sans serif ones more legible? 5. If the answers to 4 and 5 are yes and yes, is the headline intending to suggest that Mayer is hard to read? 6. What does it say about me that I circled the following passages (in blue or black ink, depending on which pen I could fish out of my bag) during the half-dozen train rides on which I read the article? It is, perhaps, a blessing that she doesn't think much, she has said, of the high-achieving mother's mantra, "balance." "I like to stay in the rhythm of things," she told Fortune. "My maternity leave will be a few weeks long, and I'll work throughout it." [W]hile American women may wish to see themselves, their maternal joys, and their workplace dilemmas reflected in Mayer, it is not a sensible comparison for most. "People—men and women both—are more likely to put a woman or minority candidate into a top position when the company is distressed," Eric Ries, author of The Lean Startup, says. When faced with a difficult decision, Mayer likes to create a spreadsheet. "I like to do matrices," she told NPR. "One option per line, different facets for each column. Salary, location, happiness index, failure index, and all that." Always work with the smartest people you can find, and always be in a little over your head. 7. What is a "happiness" index? 8. Are women more likely to run distressed companies because they're thought to be better at being in over their heads or better at being caregivers? 9. Is the desire to be in over your head to blame for a but-maybe-never pregnancy? 10. How come I can't stop comparing myself to someone so unlike myself? 11. Is she really that unlike myself? 12. What kind of purse would I carry if I made $1 million per year? 13. Would it still hold ballpoint pens? 14. What's with that dress?